Social media systems rely on user feedback and rating mechanisms for personalization, ranking, and content filtering. However, when users evaluate content contributed by fellow users (e.g., by liking a post or voting on a comment), these evaluations create complex social feedback effects. 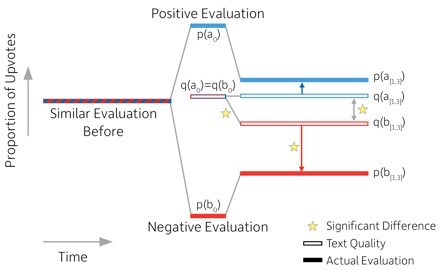 This paper investigates how ratings on a piece of content affect its author's future behavior. By studying four large comment-based news communities, we find that negative feedback leads to significant behavioral changes that are detrimental to the community. Not only do authors of negatively-evaluated content contribute more, but also their future posts are of lower quality, and are perceived by the community as such. Moreover, these authors are more likely to subsequently evaluate their fellow users negatively, percolating these effects through the community. In contrast, positive feedback does not carry similar effects, and neither encourages rewarded authors to write more, nor improves the quality of their posts. Interestingly, the authors that receive no feedback are most likely to leave a community. Furthermore, a structural analysis of the voter network reveals that evaluations polarize the community the most when positive and negative votes are equally split.